Runaway Bride. Interscope Communications 1999. Once in a writing class, we were told to look at a collection of pictures from the art department and write some vignettes inspired by those images. 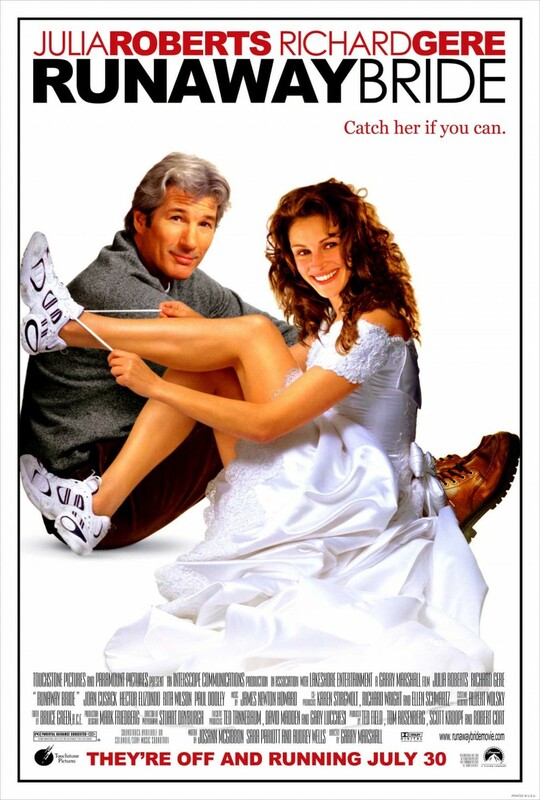 I saw a picture of a woman stepping out of a pair of fancy shoes, and I think I connected that with this movie’s poster to write a scene at a wedding reception, but the implied plot was in an entirely different direction. So apparently most of what I have to say about this movie before seeing it is nearly unrelated to it. I’m expecting a generic romantic comedy with one obvious unusual twist. And Gere and Roberts have had success before with Pretty Woman and I think a few others, so they should do well here. Ike Graham writes his assaultingly sexist opinion columns for USA Today last-minute, and his latest last-minute inspiration this time comes from a guy in a bar talking about a woman back home who ran out on seven men at the altar. Ike takes this story directly to his column, naming her and her town. In a completely foreseeable move, the subject of this story, Maggie Carpenter, seethingly writes to the editor complaining about having been singled out with incorrect information (for instance, she only nearly married three men), and gets Ike fired. Hoping to land a new job with a magazine, he goes to Hale, Maryland to try to expose that while the facts were exaggerated, her nature was as he wrote, and to catch her when she runs from her fourth wedding next week. Clawing into her life, he tries to find out her motivation for continually running and finds the real her in the process. I take this as a reconstruction of the “leave the boring guy and date me instead” stock romcom plot. Maggie doesn’t just leave her fiance, she has an egregious history of dumping men in the worst way, and it’s fully explored as to why those suitors were wrong for her and why she leaves them so messily. And even when Ike and Maggie decide they love each other, the messiness of that decision isn’t just invoked, like in The Graduate, but explored in itself, leading to the story continuing on for over half an hour after where most similar movies would end. There were a lot of supporting actors that seemed more familiar than they ended up being. I can’t find anything I would have seen Hector Elizondo, Rita Wilson, Donal Logue, or Kathleen Marshall in before, but they all had familiar looks to them, most of them looking slightly like more familiar people. I thought Marshall might have been Parker Posey, who seems to have been the quirky best friend in everything for a brief span of time in the 90s. Even Christopher Meloni, the fiance, while I have seen him in other things, is more familiar than he ought to be for what I’ve seen. Maggie’s problem seemed a bit too obvious. I spotted from the wedding videos that none of the weddings seemed to express what we’d seen of her personality, but it took the process of finding out how all four suitors thought she liked her eggs to drag that conclusion out of anybody else, when at least by the second guy saying “just like me” there should have been alarm bells. While Maggie is an extreme case, I do think that it’s healthy to adapt somewhat to reflect a relationship. Everyone is different, and different aspects come out in different combinations. One grows to fill in their partner’s weaknesses and be supported in their own. One explores new interests they may not have considered if their partner wasn’t into them. But in order to do that healthily, one needs a defined self-image as a basis, and it’s made clear that Maggie doesn’t really have a sense of who she is apart from what the men in her life want her to be. While I think a more realistic happy ending would have been a less rushed “I need to find out who I am, but I’d like to do that with you”, this story is already more thought out and honest than many others, even if the backstory is a bit fantastical. The leading pair don’t seem meant absolutely for each other, but they’re more right together than any of Maggie’s previous relationships, if only because they’re honest about their individuality, which is real and healthy in itself. A fun enough study in surprisingly deep emotional issues.